Preheat oven to 350 degrees. Butter and flour your muffin pan. Whisk together the flour, baking powder, and salt in a small bowl. 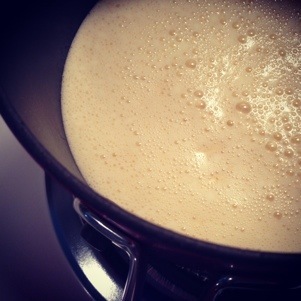 Warm milk and butter in a saucepan over low heat. Beat eggs and sugar in the bowl of a stand mixer on high speed until thick and pale, about 5 minutes. Beat in the mixture of dry ingredients. Turn up the heat and bring the milk and butter to a boil. With the mixer on low speed, add milk mixture to batter, and beat until smooth. Add vanilla. 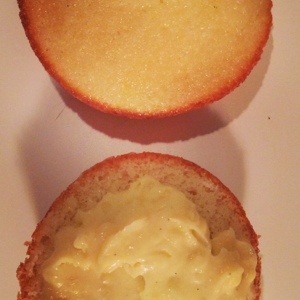 Divide batter among muffin cups, filling each halfway. Bake cupcakes until light gold, about 15 minutes. Let cool in the pan for 10 minutes, then transfer to wire racks. With a serrated knife, cut each cake in half horizontally. 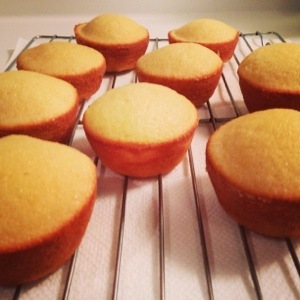 Spread 1 tablespoon vanilla cream on each cupcake bottom. Sandwich with top. Spoon glaze over each, and serve immediately. Beat yolks and vanilla bean paste together with a hand mixer until smooth. Add the sugar and beat until very pale and thickened, scrape the bowl halfway through. This should take around 5 minutes. Add the flour and mix until incorporated. Add milk into the mixture a slow, steady stream. Cook, stirring, until mixture begins to bubble and thicken, about 5 minutes. 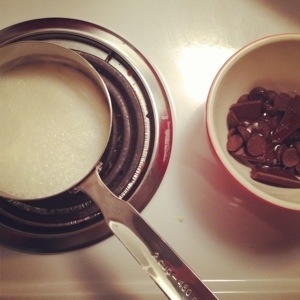 Pour the pastry cream into a medium saucepan, and cook over medium heat, stirring often, until thick, 2 to 4 minutes. Pass the pastry cream through a fine sieve into a bowl. Whisk in the butter. Press plastic wrap directly on surface. Refrigerate until cold, at least 1 hour, or up to 2 days. Bring heavy cream to a boil in a small saucepan. Remove this from heat, add the chocolate and corn syrup. Let stand for 3 minutes. Whisk until smooth. Transfer to a bowl, and allow to cool for a few minutes, stirring often. Use quickly to frost the cupcakes. 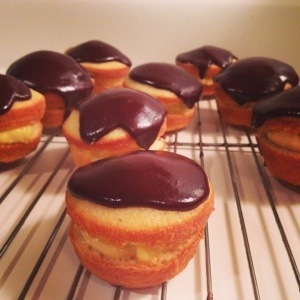 Adapted from Martha Stewart’s Cupcakes.